"Clean" install. /Users/alexander/Library/Containers/org.telegram.desktop/Data/Library/Application Support/Telegram Desktop/ is empty. [2019.03.27 01:14:49] Moved logging from '/Users/alexander/Library/Containers/org.telegram.desktop/Data/Library/Application Support/Telegram Desktop/log_start0.txt' to '/Users/alexander/Library/Containers/org.telegram.desktop/Data/Library/Application Support/Telegram Desktop/log.txt'! [2019.03.27 01:14:55] Font Error: could not locate 'Open Sans Semibold' font in ':/gui/fonts/OpenSans-Semibold.ttf'. [2019.03.27 01:15:18] Config Error: Bad digest. Same problem here. @alexander-ii i just want ask model of your mac. @MrCapone MacBookPro 13 (early 2011). Mojave was installed via http://dosdude1.com/mojave/ since it's officially not supported on my laptop. So all of us using Mojave on not supported macs (mine is MacBookPro 13 late 2011). Maybe thats the problem. Im also have mac mini mid 2012 which officially supported by Mojave. I haven't updated it yet. I'll do this later and then will check this issue. I'v checked this issue on mac mini mid 2012 with Intel HD4000 (metal supported). Unfortunately it is only pre-metal macs problem. Also i'v checked older telegram desktop versions. All versions since 1.1.29 have this issue. Latest 32bit mac version works fine. Ok now it's getting really interesting. All my OpenGL applications stop working with same issue. But it happened just after i'v updated my Xcode to 10. All builds built with older xcode versions work just fine. So its not telegram problem, many developers have this issue since apple deprecate opengl in mojave. Don't know how helpful this link is. @alexander-ii I'm not sure this is it. Does the app start working fine after you resize the window? Does the app start working fine after you resize the window? 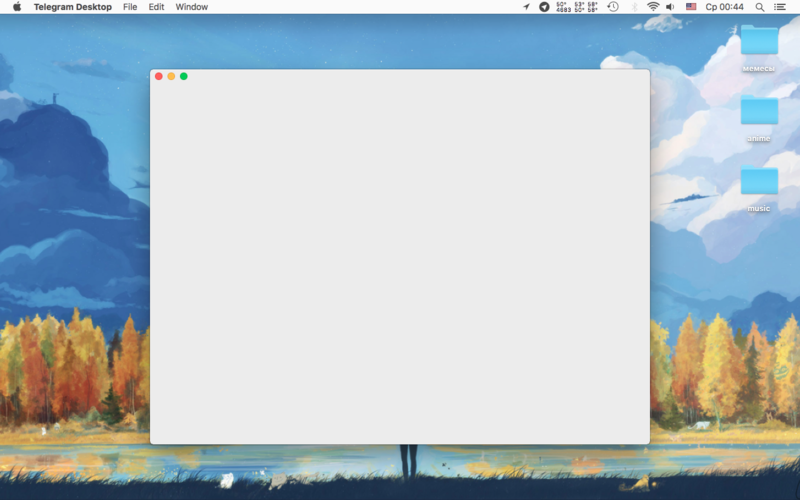 Resizing the window, going into full screen, exiting full screen does not change this. It is however able to show version information when using the Mac menus. After about a minute it started working. Maybe it was doing some sort of local data migration? @LeviSchuck Basing on the version number (5.0+) you're using a Telegram for macOS, not a Telegram Desktop (which the last version is 1.6.3). Telegram for macOS works without this issue. Since it's not telegram issue i think it should be closed. We might contact autor of dosdude1.com/mojave/ and tell him about this issue. https://github.com/telegramdesktop/tdesktop/releases/download/v1.6.7/tsetup.1.6.7.dmg partly works in my setup. https://telegram.org/dl/desktop/mac (https://updates.tdesktop.com/tmac/tsetup.1.6.7.dmg) still shows a blank window. But GitHub version crashes when you interact with a top menu bar: press command + ., or click on some menu items (all items in the Window menu group and Telegram - Preferences... item), or disabling Show tray icon in Preferences. The same actions work without crashing via hamburger menu. [2019.04.14 12:27:16] Media key monitoring disabled in Mojave. [2019.04.14 12:26:56] Moved logging from '/Users/alexander/Library/Application Support/Telegram Desktop/log_start0.txt' to '/Users/alexander/Library/Application Support/Telegram Desktop/log.txt'! [2019.04.14 12:26:58] Font Error: could not locate 'Open Sans Semibold' font in ':/gui/fonts/OpenSans-Semibold.ttf'. [2019.04.14 12:26:58] App Info: encrypted user settings read. [2019.04.14 14:04:51] Moved logging from '/Users/alexander/Library/Application Support/Telegram Desktop/log_start0.txt' to '/Users/alexander/Library/Application Support/Telegram Desktop/log.txt'! [2019.04.14 14:04:53] Font Error: could not locate 'Open Sans Semibold' font in ':/gui/fonts/OpenSans-Semibold.ttf'. [2019.04.14 14:04:54] App Info: encrypted user settings read. [2019.04.14 14:04:54] Export Info: Destroy top bar by controller removal. [2019.04.14 12:27:14] Moved logging from '/Users/alexander/Library/Application Support/Telegram Desktop/log_start0.txt' to '/Users/alexander/Library/Application Support/Telegram Desktop/log.txt'! [2019.04.14 12:27:15] Font Error: could not locate 'Open Sans Semibold' font in ':/gui/fonts/OpenSans-Semibold.ttf'. [2019.04.14 12:27:16] App Info: encrypted user settings read. [2019.04.14 14:46:17] Moved logging from '/Users/alexander/Library/Application Support/Telegram Desktop/log_start0.txt' to '/Users/alexander/Library/Application Support/Telegram Desktop/log.txt'! [2019.04.14 14:46:18] Font Error: could not locate 'Open Sans Semibold' font in ':/gui/fonts/OpenSans-Semibold.ttf'. [2019.04.14 14:46:19] App Info: encrypted user settings read. [2019.04.14 14:46:19] Export Info: Destroy top bar by controller removal. [2019.04.14 14:46:20] Media key monitoring disabled in Mojave.